Today I am going to discuss an area of the US oil field that doesn’t get a lot attention but has been and remains an important part of the US oil business. Since 1870 Michigan has been an important source of petroleum and today the state has a vibrant and healthy oil and gas community. The Michigan Basin is a nearly circular basin that is located in the lower peninsula of Michigan. The center of the basin is located in almost the center of the state with pre-cambrian rocks at a depth of about 14,000 feet at the center most part of the basin. The basin is composed of sedimentary rocks, the oldest which were deposited about 500 million years ago and the youngest about 150 million years ago. They are represented with sediments from the Cambrian, Ordovician, Silurian, Devonian, Mississippian, Pennsylvanian and small amount of Jurassic sediments at the top of the basin. The basin is about 14,000 feet thick at its deepest point. There are several unconformities in the basin (time gaps in the rocks because of uplift or non-deposition) which include Early Ordovician, Early Devonian and the Late Mississippian. Cambrian and Ordovician rocks consist predominantly of sandstones and limestones (including the Utica Shale,Collingwood Shale, which is really a shaly limestone, and the Trenton Limestone/Dolomite) which cover most of the basin. The Silurian – Devonian consists of limestones, reef limestones, dolomites, halite and anhydrite. The Pennsylvanian and Mississippian strata fill in the center and the basin has a very thin strata of Jurassic at the top of the section and located in the center of the state. The basin seems to have subsided concurrently with basin filling which would help explain why the basin predominantly has shallow water marine sediments. 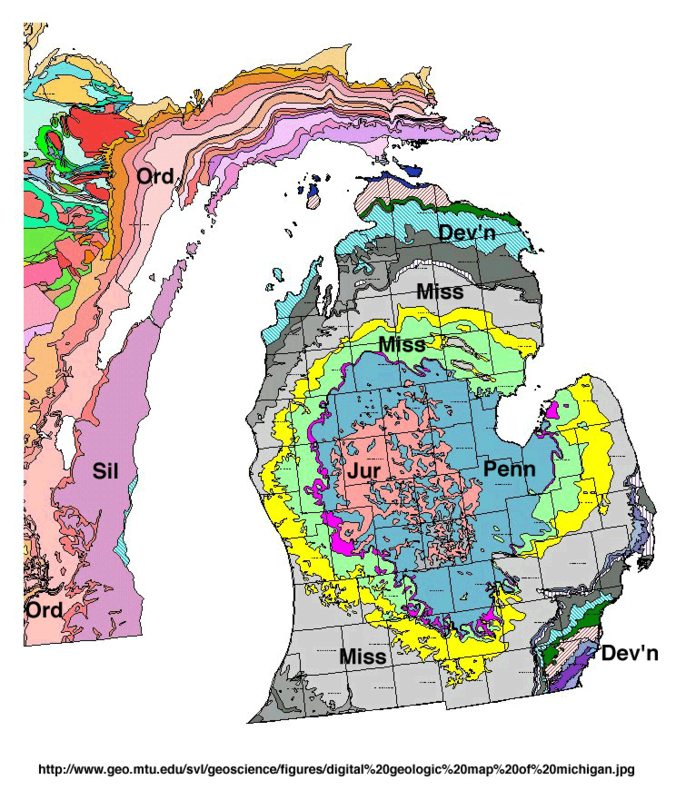 The surface of Michigan is, of course, covered with glacial sediments, which give Michigan it’s wonderful topography of moraines, drumlins, valleys, streams and of course the big lakes. Michigan is the 17th largest producer of natural gas in the US and the 17th largest producer of oil. OK this is very small by Texas and Oklahoma standards but remember the US is the third largest oil producer in the world (behind Russia and Saudi Arabia) and the largest producer of natural gas in the world. . The first well was drilled in Michigan sometime around 1870 near Port Huron (if you are unfamiliar with Michigan geography it is about 60 miles north of Detroit) and it and a few others produced small amounts of oil. The field ultimately had 21 wells before it was abandoned. The records are sketchy but reports persist that in 1872 the Mason Lumber Company of Muskegon Michigan (western side of Michigan) was looking for brine and got a flow of oil at 1200 feet. Everyone knows that flowing oil will mess up a brine well so it was never really reported except in a state geological report. Michigan oil fields didn’t hit national attention until the Muskegon field was drilled in 1927 when speculators came by the droves and began leasing acreage. 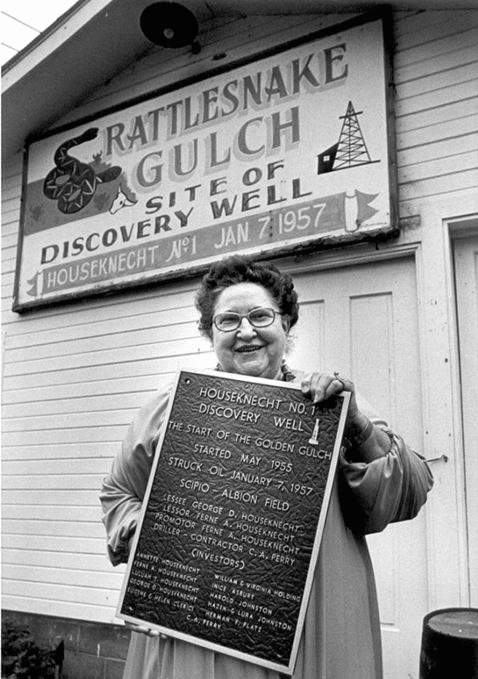 The discovery well produced 330 BOPD but subsequent wells drilled in the field produced as much as 1000 BOPD. Muskegon turned into an oil boom town with an estimated 629 wells drilled with completions in the Dundee, Upper Traverse, Lower Traverse and the Monroe formations. Almost at the same time in 1928 Pure Oil spudded the Root #1 just east of Mt. Pleasant in Midland county. The field would ultimately produce 29 million BO and would create the town of Oil City Michigan. The Oil City field discovery is the reason why Mt Pleasant is the oil capital of Michigan. Another reason is the location of Mt. Pleasant, it is located in the middle of the state. If you are going to the far reaches north, south, east or west in Michigan’s oil patch – Mt Pleasant is a great middle point. Today Mt Pleasant is home to about 94 business that list themselves in the Michigan Petroleum Directory. Side Note: What university is located in Mt Pleasant? Hint: Its mascot is the Chippewa, which honors the Chippewa Nation. No discussion of Michigan’s oil and gas history would be complete without a discussion of Michigan’s only giant oil field (at least to date). The tale is one that ignores science, reason, sensibility and instead is about legends and dreams. 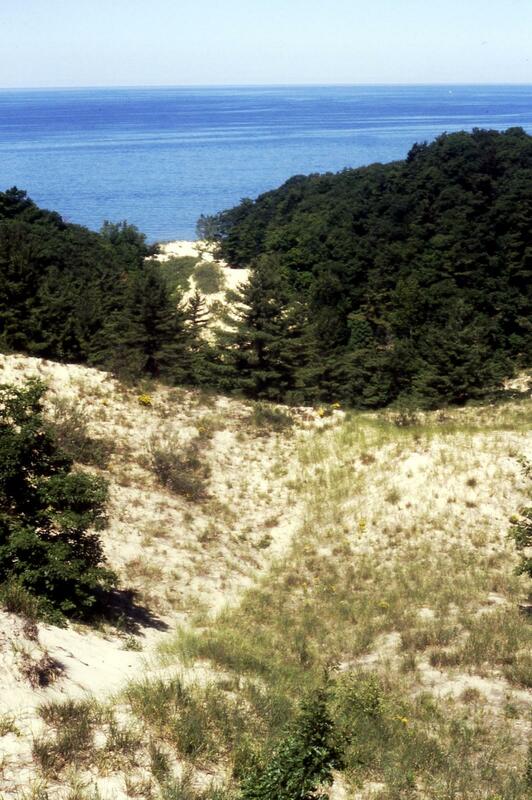 The late 1960’s brought development to the northern part of the lower peninsula as drillers looked for the Niagaran-Silurian reefs that could hold up to 450 feel of oil or gas. New technology of 2D multi-fold seismic that could, for the first, time see below the Dundee could easily pick up the carbonate reefs. Directional drilling also allowed operators to put rigs in the best location for the environment and yet tap reefs that were under environmentally sensitive areas like streams, rivers and swamps. The mid-1980 brought a little excitement with the Prairie de Chien but operators found it a bit elusive, expensive, and it didn’t produce at the rate everyone expected. There is one other piece of the O&G business that needs to discussed when it comes to Michigan – gas storage. Michigan has more gas storage capacity than any other state in the US with over 1 TCF of total storage and 690 BCF of working volume. Gas storage is hugely important to ensure the US has adequate supply in the winter when demand is high. Gas wells produce all year long, not just in the winter when it is needed the most. In the summer some of the gas is diverted to storage where it is held until it is needed for winter. The closer you can get the gas to the critical northeast markets the better you are – Michigan is ideal. There are 3 basic types of gas storage fields: aquifer, salt and depleted fields. The bulk of Michigan’s gas storage are depleted gas reservoirs. Most of the high efficiency storage fields are depleted Niagaran reefs which have excellent porosity and permeability. The trick is to fill the reservoir up in the summer and cycle it out in the winter. Many fields are taken up to and even beyond discovery pressure. The Silurian – Devonian pinnacle reefs make excellent fields because they are compact, have excellent porosity and permeability and hold massive volumes. Reto-drilling a depleted gas field for storage means you have to design a well pattern that will cycle huge volumes very quickly – 6 months to completely fill the field and 6 months to completely deplete it. Retrograde condensation, well spacing, interference and a host of other technical challenges are quickly magnified. Base gas is the gas that is left in the reservoir and not cycled every year. The geologist’s and engineer’s goal is to minimize the base gas and maximize the working gas. Storage in Michigan becomes an important role in the nations delivery of natural gas allowing gas to be produced all year long from the gas rich areas in in the gulf and still deliver high volumes in the winter to the eastern US when need is the greatest. What is next for Michigan? With the use of 3D seismic there have 3 additional fields found in the Trenton in Southern Michigan some distance away from the Albion – Scipio field. The Napoleon field was discovered in 2008, the Saline field was discovered in 2009 and the Adrian field was discovered in 2010. Together the 3 fields have produced 8 million BO and 5 BCF of gas. There has been some success with the Collingwood and it may very well be the next boom. Canadian company, Encana recently transferred all of its Michigan Collingwood holdings, rumored to be in excess of 100,000 acres, to Marathon. Some say the reason Encana left is because they couldn’t figure out the Collingwood, however, I suspect it has more to do with the $6 billion investment in the Permian basin and the focus to earn a return on that investment. The Michigan Department of Natural Resources has auctioned 120,000 acres (October 29th) in some of the prime Collingwood acreage in northern Michigan. Future drilling depends on gas prices and success in unlocking the secrets to efficiently producing the Collingwood but it certainly won’t be because Michigan doesn’t have the infrastructure, markets and the natural gas storage capacity in the summer so producers can produce maximum rates all year long. * The Albion – Scipio field has been known as the Scipio – Albion Field, the Albion – Pulaska – Scipio Field and also the Golden Gulch.